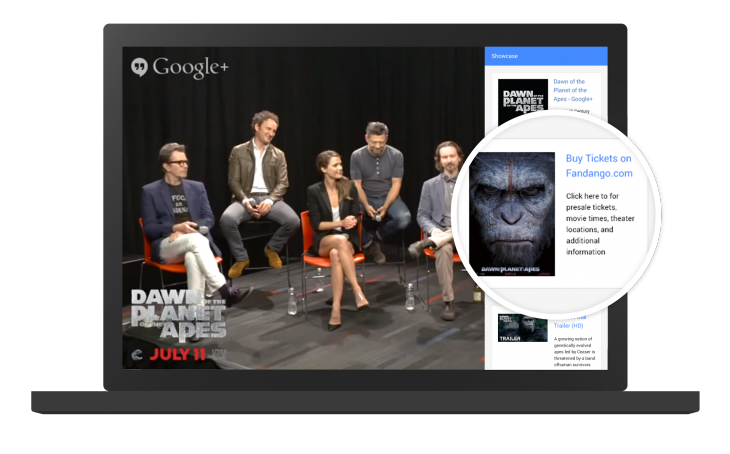 Google today unveiled Showcase, a new Hangouts on Air app that allows broadcasters and brands to easily promote merchandise and related content. In particular, Google’s live streaming tool has become a popular way for the movie industry to host Q&A sessions with a group of actors and actresses. In this scenario, the tool could be used to promote theater tickets on Fandango, the latest trailer on YouTube or the film’s official website. Furthermore, music artists could use it to share their Google+ page or new records in the Google Play store. It follows the company’s experiments with “shoppable” Hangouts on Air, which allow users to essentially host a TV shopping channel online; a fashion brand, for instance, could easily link to their garments online, while a camera retailer could promote a new model in stock.